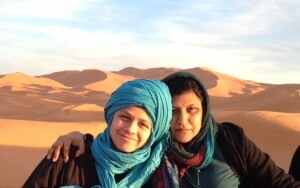 Morocco was MARVELOUS!!! Had a fantastic time, except of course for the initial slight miscommunication when we arrived. However, all is well that ends well, and the WELL started as soon as we were finally picked up from the airport. Beautiful country and people and quite an experience. Already thinking about our next trip there to see all we missed during our too short stay. Hotels and Riads were fabulous! Anita’s iPhone memory ran out from all the pic’s she took of the floors, walls, tiles, lamps, furniture, etc. – not to mention the carpets and porcelain I schlept home on the plane – (none broke)…. The tent and camel safari were probably the highlight of the trip as was driving through the beautiful countryside. Anita a bit paranoid in the dark in the Sahara – it was a bit too close to Algeria, but since I was the only “white guy” (our kids look somewhat asian, esp. Arul, age 13 who everyone said looked like a Moroccan) it wasn’t a big deal. Sights were incredible – especially since our kids are learning a lot about the history of Europe and Asia in school which was pertinent. Very lastly, complements also to our guide in Fez, Feteh! All – in – all: Grade 9.9/10. And believe me, we are very critical travelers!!!!!!!!!!! !